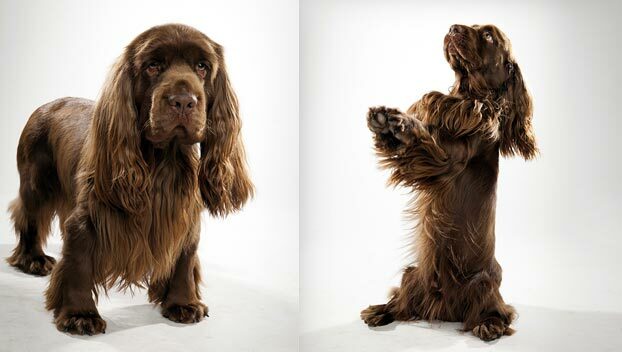 Is the Sussex Spaniel right for you? Find your perfect match now! The Sussex Spaniel is an extremely rare bird…er, bird dog, that is. They're pretty chill as far as spaniels go, which makes them fair urban canine companions. But the Sussex has never forgotten her time out in the field, flushing birds and roaming with her people. These dogs aren't fast, but they're powerfully built and maneuverable while they're hunting. Their mellow affability make them good candidates for therapy work as well. These are distinctive looking dogs, with frowny-looking faces that belie their generally cheerful demeanors. Though they're not large, their build is often described as “massive” — Sussex Spaniels have a heavy bone structure and a deep chest. This is a dog built to move and keep on moving. Originally from England, this medium-sized and medium-energy breed can grow to between 35-45 pounds and lives an average of 13-15 years. The breed is recognized by the American Kennel Club and classified as a member of the Sporting group. 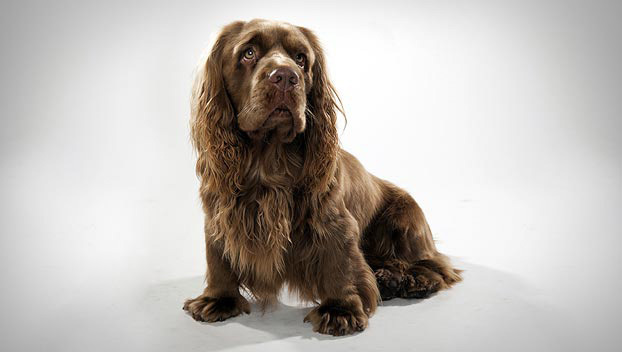 WHAT IS A SUSSEX SPANIEL'S PERSONALITY LIKE? Don't let that droopy, mopey expression fool you — Sussex Spaniels are actually a pretty chipper breed. However, these friendly dogs aren't as playful or effusive as many other spaniels. Sussexes should be socialized with children early and often. If yours grows up around kids, they'll usually get along just fine. (As always, supervised play is suggested.) Sussex Spaniels can be suspicious around strange dogs; it's best to supervise yours when she plays with new folks on two or four legs. 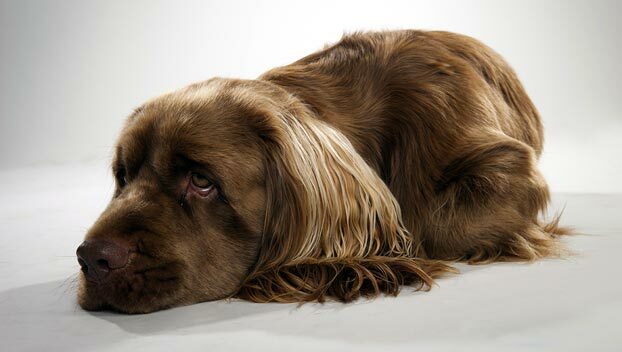 WHAT IS SUSSEX SPANIEL BEHAVIOR LIKE? While they're definitely not lazy dogs, Sussex Spaniels are less energetic than many spaniels. They'll get by with moderate daily walks, romps, or games of fetch. This breed makes for laid-back, reliable, and steadfast housedogs. Their somber faces conceal a silly, loving canine companion. The good news is that the protective Sussex Spaniel makes a fantastic watchdog. The less good news (at least if you're noise-sensitive) is that the qualities that make her a fantastic watchdog include her fondness for vocalizing. Sussexes love to bark and howl. They can also be a bit drooly. 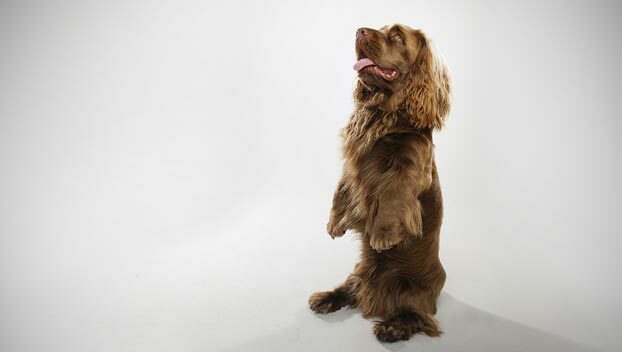 HOW EASY IS IT TO TRAIN A SUSSEX SPANIEL? These dogs are smart and respond well to training. Start early, and be patient and consistent with your Sussex Spaniel friend. Slow and steady, this breed is probably never going to win agility trials. But the athletic and versatile Sussex Spaniel competes in dog sports, including tracking, rally, obedience, freestyle, and hunt tests. HOW MUCH DO SUSSEX SPANIELS SHED AND WHAT ARE THEIR GROOMING NEEDS? Sussex Spaniels are seasonal shedders who will require weekly grooming. Their coats are wavy and soft; plan to brush them every week to prevent mats and tangles. Spend some extra time fussing over those lovely, fluffy ears. WHAT HEALTH PROBLEMS DO SUSSEX SPANIELS HAVE? As a breed, Sussex Spaniels are generally healthy. Some are susceptible to heart disease, eye ailments, or hip dysplasia. ARE SUSSEX SPANIELS GOOD FOR PEOPLE WITH ALLERGIES? The American Kennel Club doesn't list Sussex Spaniels among its breeds recommended for allergy sufferers. Remember that no breed is 100% hypoallergenic, and any breed can aggravate allergies. You can reduce your furry friend's impact on your allergies with frequent baths and brushings to reduce loose hairs and aggravating proteins in your pet's dander. Use a damp cloth to wipe off your dog after you've been playing outside. Smaller dogs have less surface area, and so produce comparatively less dander than larger breeds. WHAT IS A SUSSEX SPANIEL'S BEST DAY? Sussex Spaniels love a chance to stick their noses into the bushes and bramble. Find a safe, traffic-free area to let yours wander at her own pace. (Just be sure her recall is 100% reliable first.) Her best day is absolutely going to include chasing as many birds as she can, so may we suggest a wooded area with plenty of feathered friends? SHOULD I ADOPT A SUSSEX SPANIEL? If you disregard their vocal stylings, Sussex Spaniels make excellent city and apartment dogs. However, your neighbors may not agree. 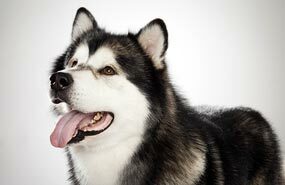 This breed is equally comfortable in warm and cold climates. If your ideal dog is one who'll keep you company on the trail but isn't interested in running your legs off, a Sussex Spaniel could be just the dog for you. 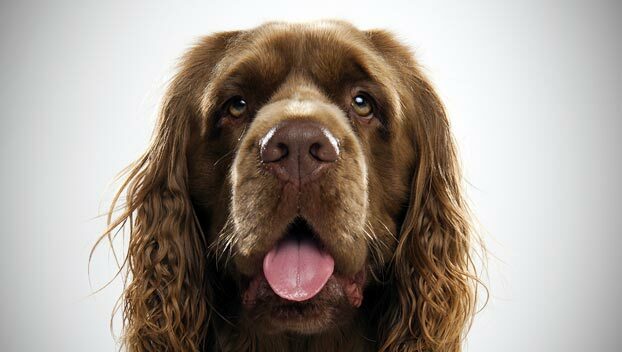 Have you decided that a Sussex Spaniel is the perfect dog for you? Why not be your new best friend's hero and adopt a rescue! Be sure to check out our article on what to expect when you're adopting a dog or cat.